The lie detector is a classic comedy premise that can now be done by anyone, without a secret assistant, with a supplied gimmick that's extra loud for extra laughs. This is made for the 21st century because it'll remind your audience of the paddle that TSA security uses at airports! 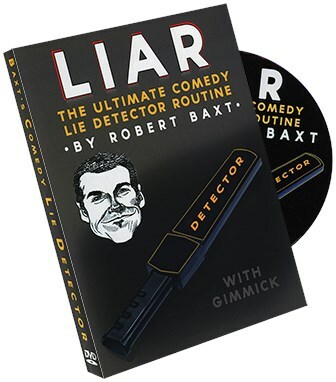 Robert Baxt shows on this DVD how to easily and inexpensively make this gimmick into a security metal detector looking prop, along with examples of other props you can readily create. Bonus PDF File with 23 pages of Jokes, Gags, Bits, Lines, Routines, and Suggestions for this wonderful prop. The secret noisemaker that you can easily hold in your hand. Funny gags that you can add to any show! Comedy for STAGE or CLOSE-UP!